Posted	 2:34 am by	tonyfigoli	& filed under . A rectangular back yard with strong winds and roadway noise was what the Hughes family had to start with. Neighboring houses loomed over the fence on two sides and powerlines were a visual barrier along the length of the backyard. The back of the house seemed plain and, despite the width of the lot, the shallow depth from the back door to the existing berm and back fence made the garden feel small. In response, we designed three schemes that all attempted to unite the interior of the home with the exterior garden, to create a variety of landscape rooms adding a sense of destination and surprise, and to unify and lengthen the garden space by using strong sinuous forms. We all agreed that a water feature would address their existing drainage issues and create white noise to mask the roadway. In addition, the Hughes wanted us to include a hot tub, a covered outdoor kitchen area and a secluded seating area with a fire pit. Privacy was a must, as was improving the views to the fences, powerlines and neighbors’ houses. 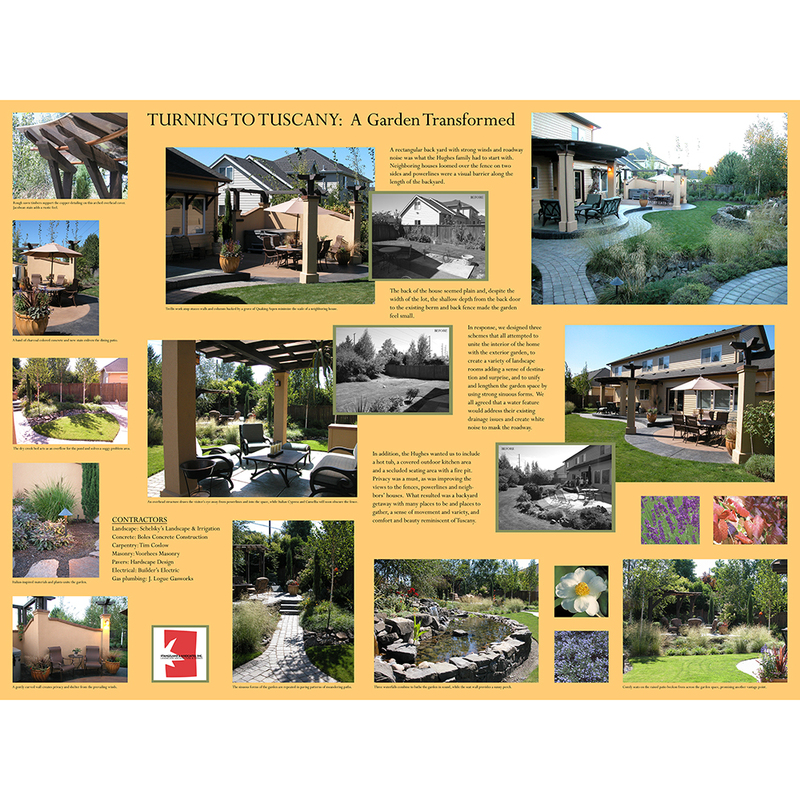 What resulted was a backyard getaway with many places to be and places to gather, a sense of movement and variety, and comfort and beauty reminiscent of Tuscany.